It takes a village to entertain small children on a long flight. Here are three of our favorite things to bring on board. Not only are these padded headphones super comfy, but they also keep the volume below 80-90—to protect children’s hearing, even if they accidentally crank the volume on their devices. The sound quality is great and they rarely require readjusting. Available at Magic Beans. In-flight coloring only makes sense if you’re not constantly picking up dropped crayons off the floor. P’kolino’s are triangular in shape and won’t roll off the tray table. They’re also gigantic, so they last a long, long time. Available at pkolino.com. 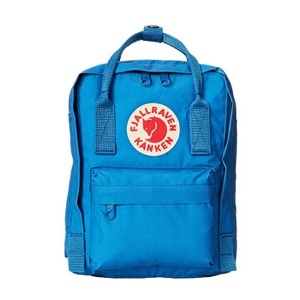 Available in many fun colors, the mini packs from Fjall Raven are nicely sized for small travelers—with plenty of pockets for stashing all of their Very Important Belongings (shopkins, lollypops for descent). Available at fjallraven.us or zappos.com.